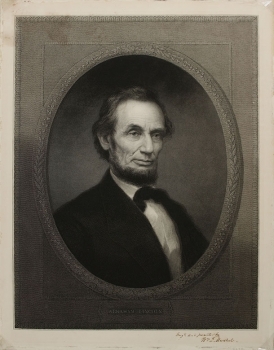 Abraham Lincoln visited Albany twice, the first time in 1861 while on his way from Springfield, Illinois, to Washington for his March 4 inauguration as the country’s sixteenth president. When Mayor George H. Thacher greeted the president-elect as he stepped down from the train on February 18, 1861, he said, “Mr. Lincoln, on behalf of the Common Council and the citizens of Albany, I have the honor to tender you the cordial welcome of the city,” Lincoln’s reply could barely be heard over the deafening roar of the crowd. During his brief time in the city, he addressed the New York State Legislature, dined with Governor Edwin D. Morgan, and met with citizens of Albany at the Delavan House, where he stayed overnight. The next morning, Lincoln and his entourage boarded a special train and continued their journey to Washington. The second time was on April 26, 1865, and the people of Albany once again came out by the hundreds to honor him. Twelve days earlier, as Lincoln was attending a play at a theater near the White House, he was shot in the head by an assassin. His death the next day set off a period of national mourning which involved a special funeral train retracing most of the 1,654-mile route the president-elect had made just four years before, only now in the opposite direction to take his body home to Springfield for burial. That journey also included a stop in Albany, where his remains would lay in state in the New York State Capitol for several hours before continuing on to Illinois.